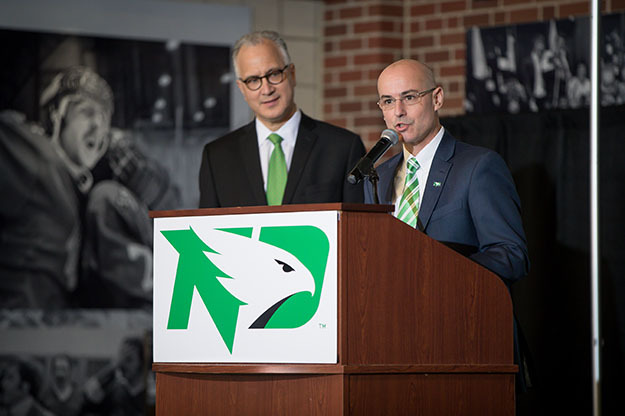 UND President Mark Kennedy (left) introduces UND’s newest Director of Athetics, Bill Chaves, at a public gathering and celebration Tuesday at Ralph Engelstad Arena. Photo by Shawna Schill/UND Today. The blare of UND Pride of the North horns and drums filled the Ralph Engelstad Arena lobby on Jan. 16, with glittering pom-poms guiding a new Fighting Hawks leader through dozens of fans, alumni, coaches, staff and students. Epic pomp for significant circumstance. 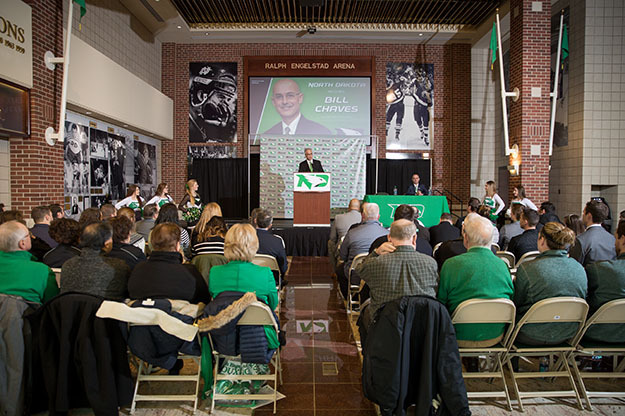 This was new UND Athletics Director Bill Chaves’ introduction day, and, in a style which many have already noted, he quickly turned the attention from himself to the students. Chaves is UND’s 16th athletics director, taking over for the retiring Brian Faison, who led the department to regional and national success for nearly a decade. Faison announced his retirement in October, sparking a search for the program’s next captain. A recent change in state law, which now protects the identity of candidates until they are named finalists, allowed the search committee to draw multiple sitting Division I athletics directors to the position. UND President Mark Kennedy said the incredible applicant pool made his choice a difficult one. A crowd gathers in the lobby of Ralph Engelstad Arena on Tuesday to hear from UND’s 16th and newest Director of Athletics, Bill Chaves. Photo by Shawna Schill/UND Today. The President touted Chaves’ achievements as athletics director at Eastern Washington University, which include two National Athletic Director of the Year awards, a 2010 NCAA Division I Championship in football, and an appearance at the “Big Dance” – the NCAA men’s basketball tournament. 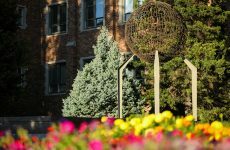 Kennedy also highlighted successes like three Big Sky President’s Cups, awarded to the conference’s highest performing programs when considering both athletic and academic achievement – something that cuts closer to the core of Chaves’ priorities. 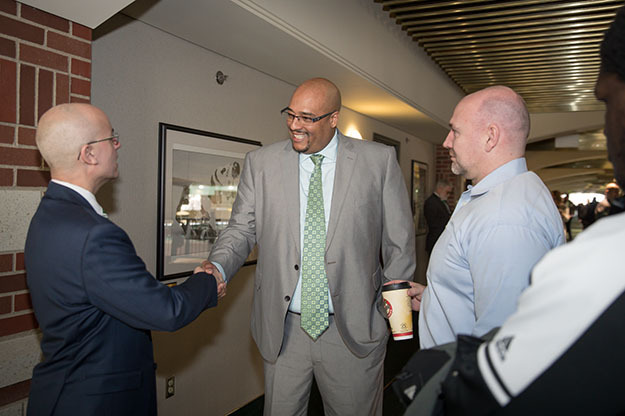 Chaves (left), who comes to UND from a similar position at Eastern Washington University, meets UND women’s basketball coach Travis Brewster and head volleyball coach Mark Pryor for the first time as their new boss. Photo by Shawna Schill/UND Today. Chaves laid out how he plans to work hand-in-hand with the coaching staff to inject direction and drive into an already excellent program that’s now approaching transitions into two new conferences. The way to do that? A bit of strategy. 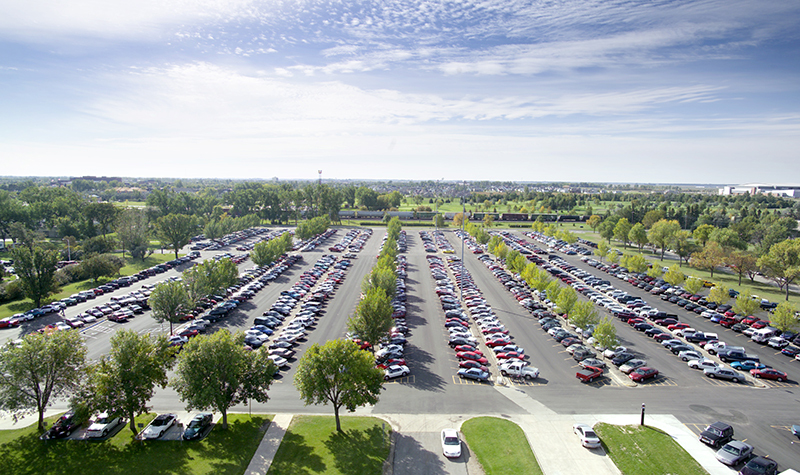 “The One UND Strategic Plan for the institution is tremendous. 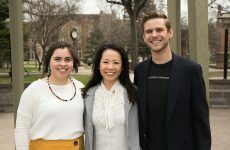 I think the Athletics department can follow suit with a plan of its own that can lift the department, and I look forward to building that,” he said. Women’s Basketball Head Coach Travis Brewster said that it’s clear Chaves had a plan for UND Athletics in mind when he applied for the role. Just as clear is his excitement about now having a chance to implement it. “When you see the growth that our Athletics department has had over the years, you have to thank Brian Faison for getting us to this point. But now you can already see that [Chaves] is ready to put the program into hyperdrive,” Brewster said. To ensure that all voices are heard, Chaves wants to start his tenure with a “listening tour” – an opportunity to gauge internal and external concerns and take action. Chaves’ concluding thoughts turned to his wife and children, whom he began to thank, and then took teary pause. Seconds passed before he gained composure. “He’s the kind of person who I think will fit in well here at the University of North Dakota, and I think we’ll very much enjoy him, his wife and his family,” President Kennedy told onlookers. And to help him fit even better into the UND culture, the President presented Chaves with a Fighting Hawks hockey jersey, “CHAVES” emblazoned across the back.